Years ago, making a “home movie” was something that anyone could do. With a little point and shoot, it didn’t take much effort to scrap together a rough-cut short film with your friends. 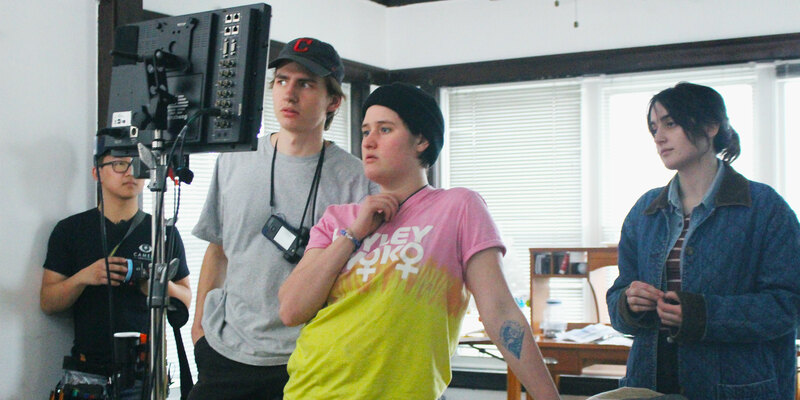 These days, some DePaul students still wish it was this simple, because when a DePaul student says they’re filming a short film, the process these students go through to produce these independently run films is nothing short of demanding. First, a student must spend time planning how production for shooting is going to look. “We spent the entire fall quarter assembling our team of people and having meetings about what are shoot dates would be,” said Carson Rieck, a sophomore film student and director and screenwriter for a short film called Building 57. “When we came back for the Winter Quarter we tackled casting and locations and finalizing our crew. This is when DePaul’s Production Office got involved.” Rieck’s short follows the story of several tenants living in an apartment building. In this thriller, the landlord manipulates his tenants into thinking the world is ending by broadcasting a fake news story onto their televisions, and film chronicles the tenants responses and choices after hearing this news. 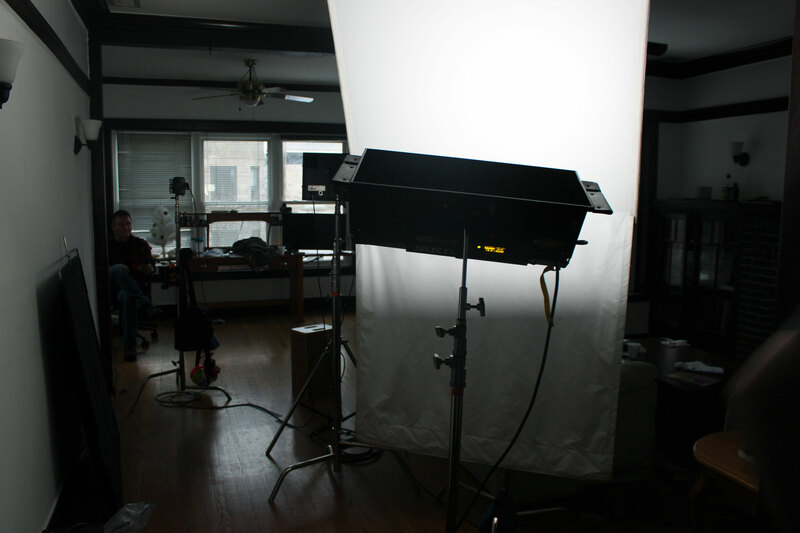 After production planning, if a student wants to use DePaul’s equipment, they have a series of documents they must think about — including how they are going to get their film insured. “Technically, if a student’s film project is not affiliated with DePaul through a class or anything, they are not insurable,” said Nick Schmidt, assistant manager of production operations at DePaul. “However, there are a lot of ways to still make it work. You can ask for extra credit for a class, for example, which is what a lot of students are doing. Or, you can file an independent study with the Production Office. Something like that might cost $500, approximately.” After that, the student spends several weeks getting paperwork finalized before filming can actually start. “DePaul’s Legal Counsel asks for several weeks to look at student contracts before they can start filming,” said Schmidt. People who operate most places at which students choose to film will want documentation in place so that they will not be liable if anything at the filming location gets damaged. Rieck chose to film both on and off campus. His team used DePaul’s filming facilities for shooting when scenes required a green screen, while the rest of filming took place at his apartment. Students also fill out a form for the production office where they send in their scripts to be reviewed in case any other kind of legal counseling is required. After students are covered, they can start checking out gear. Rieck’s team rented out their cameras — the main one being a Sony PMW-EX1 — from the the Loop Equipment Center, also known as “The Cage,” and rented out lighting equipment, screens and other items from Cinespace. Cinespace is a movie filming studio in West Chicago that all DePaul film students take classes in and have access to in their own projects. Besides ensuring that they are securing the cameras and equipment they are going to use, DePaul students must also figure out who they want to star in front of the camera. However, students are not just limited to the pool of DePaul actors — they also have access to online casting sites that connect them to any kind of actor they want. Just like in a full length feature film, students can call in their actors and select them by hand. However, selecting actors is not the only part of pre-production that student directors must consider — their own team is just as important. Rieck assigned each group member a lead position in their field of expertise, and most of the leads added their own staff to help out before filming started. “A lot of the time when you bring on people to be department heads, they bring on other people to help them out.” Rieck’s team ended up being more than 20 people after all the department heads brought on their own internal teams. The main character on set of Building 57 — the “villain” in the story — is played by Bobby Bozek, a retired high school principal turned small film actor. Bozek found the role from looking on casting sites online. “You read about this stuff on the casting site and it seemed like this was going to fit really well with what I do. That’s usually how I find these roles,” said Bozek. “My brand is police, detective, ‘bad guy,’ so this kind of stuff is right in my wheelhouse,” he said on his role as the conspiracizing landlord who plots to kill his tenants. For someone like Bozek, having the desire to work on an unpaid set of budding film majors might seem like an un-incentivized choice, considering he was not surrounded by paying professionals. Bozek, however, could only express his appreciativeness and excitement about working on the set. If you are a CDM student at DePaul, or you can get a go-ahead from an advisor or professor at DePaul, you have access to the university’s extensive amount of equipment. Although the short film Building 57 was just a student film, much like every other short film produced through DePaul, an immense amount of behind the scenes work went into it. So, next time you’re thinking of shooting a short film, or jumping on your friend’s set, clear your schedule for the next few weeks — you’re in for a very involved process.